Oily skin isn't just a problem for teenagers; many adults have oil-prone skin, too. As people age, the excessive oil production that occurs in high school will gradually decrease, but waiting to get older is hardly a solution for dealing with this skin type. Even though oily skin usually shows less signs of aging compared to dry skin, it can still be too oily for people who would prefer a more balanced skin type. While it used to be common practice to advise people with oil-prone skin against eating foods high in oil or fat, most medical experts today, such as Dr. Hillard H. Pearlstein, agree that foods do not cause oil production. Instead, hormones and heredity are primarily to blame. Humidity can also contribute. Any of these factors can cause the sebaceous glands to work overtime, which results in excess oil production. Although many people are bothered by the shiny look of oily skin, an additional problem is that it often leads to acne. Keeping the skin clean and well cared for will reduce the likelihood of breakouts. Fortunately, there are a number of methods and products for dealing with this problem. Although hot water may sound like the answer for getting rid of oily skin, dermatologists suggest using warm to tepid water and mild facial cleansers. Wash your face no more than two to three times a day, using your fingers or a non-abrasive cloth. While you do want to slough off dead skin cells, scrubbing can aggravate the skin and stimulate it to produce more oil. Gentle exfoliation is preferable -- you can even do this with a washcloth. Problems with this skin type can be exacerbated with rough handling and overwashing, so be careful not to overdo cleansing and exfoliating. Using mild astringents after cleaning the face can help remove soap residue and tighten pores. Avoid harsh toners, which can dry the skin excessively. Also avoid heavy or oil-based moisturizers. Instead, opt for those specifically formulated for oily skin. Weekly facial masks can help rejuvenate skin. Clay or mud-based masks are best for oily skin because these ingredients are drying and help to draw out and absorb the oil. 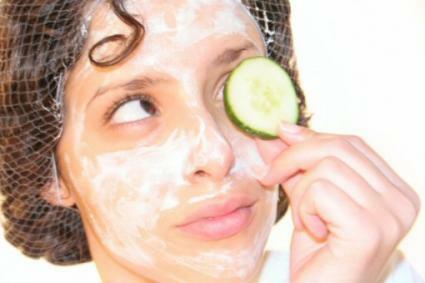 In addition to mud or clay-based masks, commercial or homemade masks that include natural ingredients like cucumber, oatmeal, and lemon can be very effective. Oil Control/Prevention Lotions: Oil-preventing creams or lotions help reduce facial oils and can help your skin look fresh and beautiful. Keep in mind that these may not last all day, and you might have to try several different brands before you find one that works to your satisfaction. These are also available in serums and are sometimes combined with moisturizers, like MAC Cosmetics Oil Controlling Lotion. Oil Blotting Papers: Oil blotting papers, like the ones offered by Clean and Clear, are specially designed to absorb the oils on your face. Gently press or blot against the skin. These can be used with great results on bare skin or over makeup. In a pinch, you can do the same thing with a piece of tissue, although it won't absorb as much grease. Cleansing Pads: Cleansing pads are small cotton rounds that are pre-moistened with a cleanser or astringent. The pads dissolve oil and do not require rinsing. These are a good alternative to regular facial cleansing when on the go. Combination products: Many products are formulated to combat oiliness and acne. Masks, creams, face washes, and astringents for oily, acne-prone skin often contain benzoyl peroxide or salycic acid. Chemical-free options include the all natural Mario Badescu and dermatologist recommended Neutrogena product lines, which are gentle and effective. Makeup for women with oily skin should be water based. Many companies make light, sheer, water-based foundations, like Maybelline's Pure Stay makeup line, that work well. A tinted, oil-free moisturizer may also work well. Powders can also help to reduce shine. Some powders are specially designed to combat this, like Estee Lauder's Double Matte Oil Controlling Pressed Powder. For best results in controlling oil, cosmetic artists suggest patting rather than brushing when applying powder. Many people with oily facial skin also have problems with other parts of their bodies, such as chest, back, and shoulders. Using mild soaps or body washes and avoiding scalding showers can help reduce oil and breakouts. You can also use oil controlling lotions on these areas if desired. Although they may not completely stop the production of the sebaceous glands, vitamins A, B complex, B12 and E, as well as zinc, can assist in producing healthy skin tissues. Skin oils on the scalp can cause scaly or flaky build up. Using mild clarifying or dandruff shampoos can help combat this problem. Avoid applying hair oils or shining serums close to the scalp. Although you may not necessarily be able to "cure" oily or acne-prone skin, using the right products and practicing proper care can drastically reduce oil and breakouts. Treat your skin with care, and don't be overzealous in your cleansing or scrubbing -- this can make acne and oil production worse. Once you learn to manage this skin type, you may enjoy the benefits of a well-moisturized complexion, including a youthful appearance, throughout adulthood.